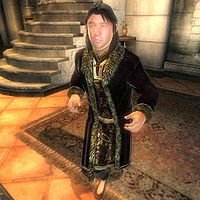 Jakben, Earl of Imbel is a snobbish Breton spellsword who owns a huge mansion in the Talos Plaza District of the Imperial City. According to the Gray Fox, Jakben is the last descendent of famous thief Springheel Jak and will send you to investigate him during the Boots of Springheel Jak quest. However, the Earl himself turns out to be a cowardly, helpless man, at least until he reveals his true persona. For a nobleman, Jakben sleeps at unusual times; at 6am he will enter the family crypt in the basement and stay there for twelve hours. After waking up at 6pm, he heads up to his private quarters and spends the rest of his day wandering around, interrupted only at 7pm and 3am when he will spend two hours in his study. On all days but Sundas, he will break off his routine at 10pm and leave the house for a nightly four-hour stroll in the garden behind Umbacano Manor. After you have received the related quest from the Gray Fox, Jakben will skip his twelve-hour sleep due to a bug. Jakben, being a wealthy noble, wears fine upper class clothing consisting of a black and burgundy outfit and the Boots of Springheel Jak. He carries a red velvet garment and a spare pair of gold trimmed shoes. Besides his house key, he also carries leveled light armor and a leveled amount of gold. He is also equipped with a longsword or claymore, which may be enchanted if you are level 3 or above. During the quest he will also carry the key to the family crypt underneath the mansion. Speaking to Jakben before beginning his related quest will have him rudely greet you with: "Jakben, Earl of Imbel. We do not know one another. And, given your modest social standing, I doubt we ever shall.". Asking him about the Imperial City will have him reply: "It is so kind of you to favor me with your attention. Please excuse me if I seem unappreciative of the honor. ... Was I insufficiently clear? I beg your pardon. You do not interest me. We will not be having further social discourse." Although inapproachable, Jakben will play an important part in the master plan of the Gray Fox, who will say: "I need the boots of Springheel Jak. He is a famous thief that died some 300 years ago. Legend has it that he was buried with his boots on." and will continue on with: "The Earl of Imbel is the only descendant of his line that I have been able to locate. His name is Jakben, and he lives somewhere in the Imperial City. There might be a clue in the Earl's house." 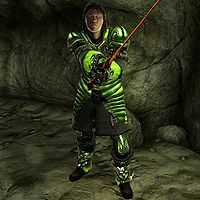 Asking the beggars in the Imperial City will net you more information on the nobleman: "The Earl of Imbel has a home in the Talos Plaza, on the inner wall. He is an odd one. Keeps to himself mostly. Only goes out after dark. A real night owl." Also, if you happen to run into Gemellus Axius, Jakben's manservant, additional information will be revealed of the supposed 'night owl': "The Earl is perhaps not well known in the city. He is a private man, and keeps to himself." and "Master Imbel has his home facing the central plaza of the Talos Plaza district. He is a very private man and does not leave his home often. He has a rare skin condition that forces him to sleep during the day. If you wish to contact him, wait until nightfall. Even then, I doubt he will receive you." If you approach Gemellus in Jakben's mansion, he will hint at the true identity of the Earl: "The master is not at home. He is out in the city tonight, searching for his supper. If you value your life intruder, leave before he returns." As soon as you get near Jakben, he will cower and shout: "An intruder! Help! Don't hurt me!" When you talk to him, the Earl will say: "What do you want? I'll do anything you ask!" or "Please don't hurt me!" When asked about the Boots, he will cowardly say: "Take everything, just spare me!" When you demand an explanation, he will hand you the key and add: "The family crypts are under the house. They give me the creeps. I have the key. Take it. Just don't hurt me!" When you exit conversation he will say: "I'm... I'm still alive!" then run into his study and lock it. However, his act as a coward is soon to be revealed, specifically in the Crypt underneath the mansion. It houses an entire horde of vampires and undead enemies and the Diary of Springheel Jak reveals that Jakben is in fact Springheel Jak who supposedly died 300 years ago, but managed to survive due to vampirism. When you put the diary down, Jakben will appear in full armor and attack you, shouting, "Fool! I am no effete noble!" and "I am a vampire, a Lord of Blood!" He will then fight you to the death. After the quest, a new edition of the Black Horse Courier will reveal what happened and the citizens of the Imperial City will start saying: "Did you hear that the Earl of Imbel's house was robbed?" and, more accurately, "The Earl of Imbel was attacked and killed in his own home. I heard the body burned in the sunlight." The cattle of this city know me as Jakben, Earl of Imbel. Centuries ago I knew myself as Springheel Jak, the famous thief. I seem to recall having a famous partner, but his name escapes me. No matter. I have grown beyond friends and partners. I rule the night here in the city. Jakben's diary tells the tale of a thief he once knew, who "dared to steal from Nocturnal herself". This suggests he knew Emer Dareloth, the first Gray Fox. Jakben has certain stage four vampire abilities such as Hunter's Sight and Embrace of Shadows. Strangely, he is a stage one vampire. When you accept the quest from the Gray Fox, Jakben will stop sleeping in the crypt between 6am and 6pm. This package was supposed to be reactivated when you have received information from the beggars, but the corresponding Journal Entry (25) is missing from the game. This causes Jakben's schedule to break and he will never go to sleep again. Jakben was supposed to 'hunt for supper' on Morndas, Middas, and Fredas only. Instead, he takes his 10pm trip outside six days in a row because the package runs past midnight, in the process messing up the days for the AI. Esta página foi modificada pela última vez à(s) 05h31min de 20 de outubro de 2015.